Welcome to Iowa City, aka Poetry City, where key Actualist sites have been targeted by urban development for over forty years. What’s Actualism? It’s a poetry movement that was quietly born out of a conversation between a Finnish-born Writers Workshop instructor Anselm Hollo, a few of his students and other poets living in Iowa City. 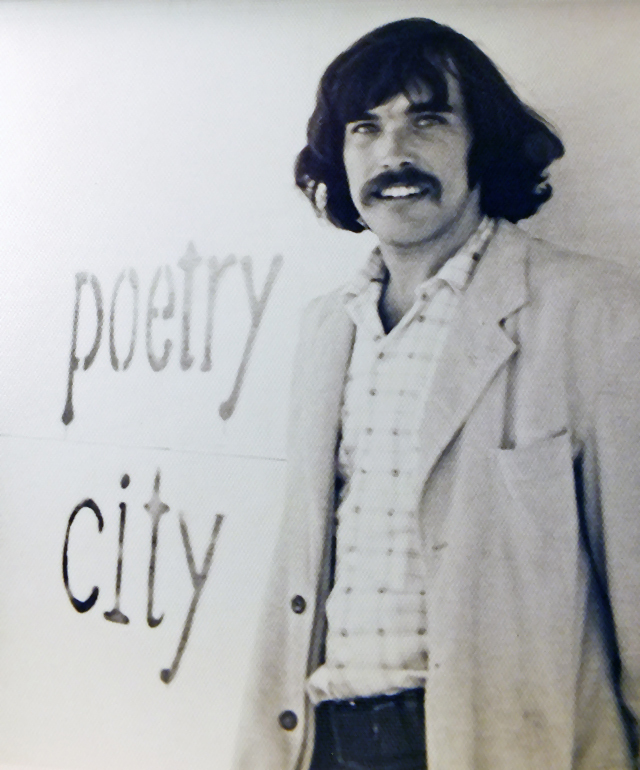 While some of them were hanging out in George Mattingly’s apartment at 214 East Court Street — long since torn down as a bit of urban renewal — Hollo suggested the poetry group could become a movement. “Good idea,” said Darrell Gray. But the idea was laughed off by Mattingly who said if they became a movement then they would need membership cards. “Good idea,” said Gray again. 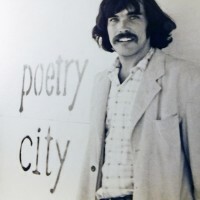 By the next day, Gray (a 1968 graduate of the Writers’ Workshop) had a name for the burgeoning poetry movement: Actualism. It was 1972, and people like Hollo, Mattingly, Gray, Allan Kornblum, David Morice and Morty Sklar formed the core of the Actualist movement, which has its roots in Dadaism and often relies on poetry that is performed. Much of their work was concentrated on disrupting the seriousness of the Writers Workshop, which they felt had fallen into a trap of academic thought. Actualism was a way to mock the Workshop mentality. Predictably, Actualism had a decentralized structure, but Epstein’s Books became a meeting place. The original store at the corner of Washington and Clinton streets was among the buildings torn down to make way for the Old Capitol mall. By the end of 1972, Gray had written an Actualist Manifesto that Morice published in his magazine, Gum. Actuality is never frustrated because it is always complete. The purpose of “intention” is to complicate a matter. A material paraphrase is a complication. Typing through sunglasses is, of course, an alternative. barely room for the table and bed. The World has changed its mind. Ice cream is on sale. from the fact that words are writing us. dispersal throughout all the sensory regions. An object is a condition of liberation. Where is the missing balance? than their conditions are characterized by them. Gray may have been Actualism’s biggest advocate — an Actualist’s Actualist if you will. He went on to spread the word in the San Francisco Bay Area where, eventually, eight Actualist conventions were held. But in Iowa City, the first Actualist convention took place on March 10, 1973 at the Wesley House. 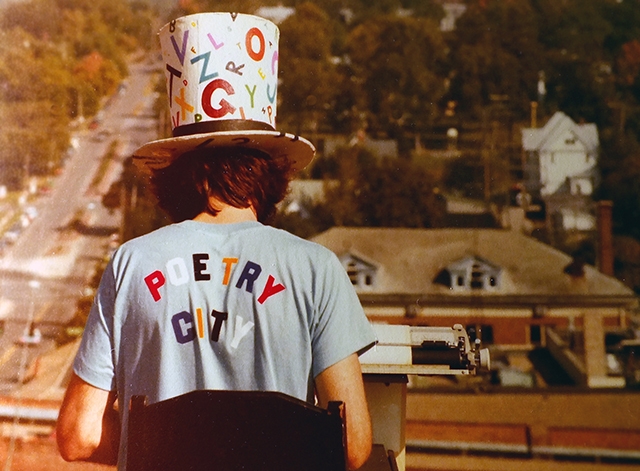 One week before their inaugural event, Morice ran his first Poetry Marathon while sitting at Epstein’s Books, writing 1,000 poems in six hours, three to a page. In 1977, Morty Sklar co-edited and published The Actualist Anthology, which included works by Hollo, Morice, Allan Kornblum, Chuck Miller, Sheila Heldenbrand, George Mattingly, John Sjoberg, David Hilton, John Batki, Jim Mulac, Steve Toth and Cinda Kornblum. Today, Sklar runs The Spirit That Moves Us Press from Jackson Heights, NY. In 1983, he was the first in the U.S. to publish Czechoslovakian poet Jaroslav Seifert, the Nobel Prize winner for Literature in 1984. In 1989, Sklar moved back to New York City to care for his mother. Still living in Iowa City today, Morice was in the Workshop when Actualism began, and he eventually dropped the shortest thesis in Workshop history — a tiny chapbook titled Poems. The following year, the department made a rule that any Workshop thesis must have at least 35 pages. Morice claims to have given a reading of his thesis in under 30 seconds. Performing his poetry, Morice wrote under the pseudonym “Joyce Holland,” then later became “Dr. Alphabet,” and he once created a poem that wrapped around Epstein’s Books. Another time, he gave away “Poetry Tonics,” potions with verses floating in tiny vials. It was a taste of his own medicine — the intoxicating effects of words. “We called Iowa City ‘Poetry City’ back then, and here it is 30 years later, and they call it the ‘City of Literature,’” said Morice laughing in an interview at the Hamburg Inn. Since the 1970s, municipal neighborhood initiatives converted Iowa City real estate into urban renewal projects — including Epstein’s Books and other key Actualist sites — using money from the U.S. Department of Housing and Urban Development (HUD). City leaders saw dollar signs behind the town’s Victorian architecture and were moved to remove the old buildings. At the heart of the real estate grub was developer Freda Hieronymous. She spearheaded a plan that coalesced around the plot of land south of the Pentacrest and led a downtown urban renewal program that eventually built the Old Capitol Mall for $18 million. The project was completed in 1981. A temporary urban renewal module put up at 125 South Dubuque St. housed Epstein’s Books for a few years while the Old Capitol Mall was built. 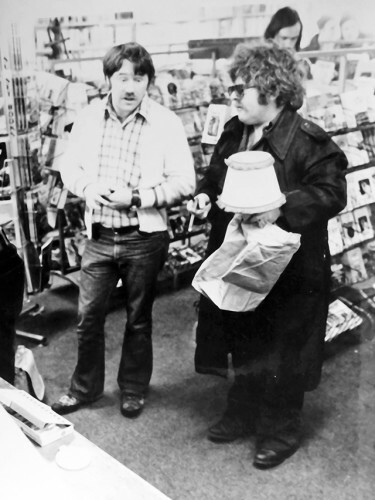 Harry and Glen Epstein were promised a space in the mall, but high rent would make it impossible to continue in the mall, and the bookstore folded in 1977. Later, on the site of Epstein’s abandoned urban renewal module, Hieronymous helped build Plaza Centre One. Two other key Actualist sites are still standing: The Sanctuary, which once held weekly poetry readings for 52 weeks straight, organized by Jim Mulac; and the worker cottage at 610 South Dubuque, which in 1975 became a bookstore called Alandoni’s run by Alan Frank; then in 1977, it became Jim’s Used Books and Records, where Mulac ran the store until 1981. 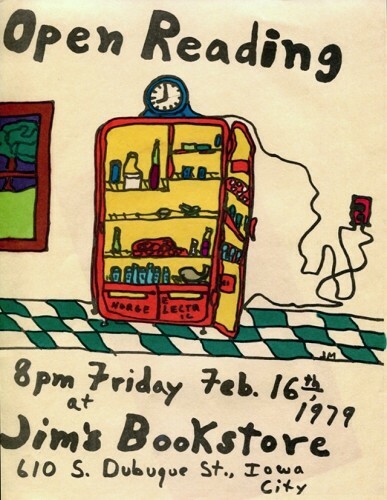 Fast forward to 1986, when Will Ingles was looking for a place to live and start a bookstore. He spoke to Freda Hieronymous, the property owner of the cottage where he eventually moved. In order to allow him to establish residence, they had to comb records and prove to the city that the buildings had always been used as both residential and commercial properties. Ingles moved into The Book Shop and set up a business. Today he is embroiled in a fight to stay in his home, keep his store open and keep the 150-year old cottage (and two others, including the 610 South Dubuque cottage Actualist site) away from the wrecking ball. That Poetry City eventually became the City of Literature, and the buildings that housed the players and instigators of Actualism, is an ongoing story. Iowa City owes a debt to the Workshop and the Actualists for its renown as a place of writing. Will the city (and the University) put Actualist sites on a pedestal of historical importance? Or will they brush the movement aside in the push for more students and apartment buildings? 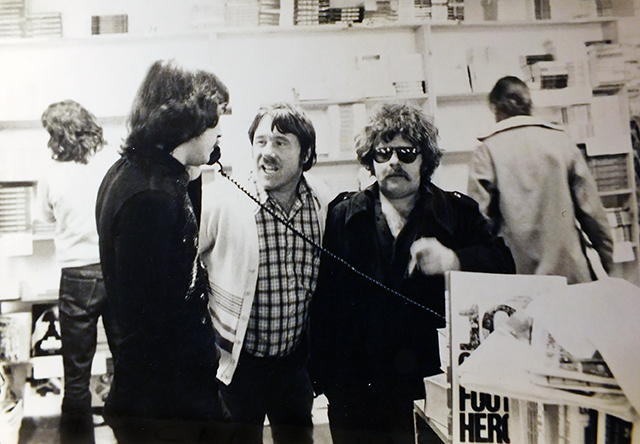 Adam—although you mention Jim Mulac’s weekly poetry readings for 52 weeks straight at the Sanctuary, you DID NOT mention the weekly readings forever at his Jim’s Used Books & Records at 610 South Dubuque. The poster you printed, which I sent you, is an example. hi great to see this article. it will include readings of work by and about allan and cinda and others, as well as stories. remember allan* his memory is for a blessing* bring something to read, or ears to listen. or both! The article states that the actualist “movement” was birthed at the end of 1972, but Aladonis didn’t start in the South Dubuque cottage until 1975, and Jim Mulac didn’t form his bookstore there until 1977. If the first actualist convention was in 1973 at the Wesley House, the birth of the actualist movement could not have occurred in one of the cottages on South Dubuque. Bobby Jett, I was 6 in 1972 and you are my age or slightly younger. I have blurry memories of some of this because of the art circles my father traveled in here when I was 6, but neither of us is qualified to tell what was or wasn’t happening where at this time other than to read other people’s accounts and cherry pick things that justify our opposing viewpoints on this topic…so honestly, it would be more appropriate for both of us to be asking questions instead of making statements as “fact” when they would require more information from the individuals and, perhaps, even photographic records that exist…and that’s where I’ll be looking. Julie i was merely commenting on the facts in the article as stated. I was 11 years old in 1972. Lord help us all if that bookstore goes down and the shade of Harry Epstein comes to town as the ghost of Christmas past. 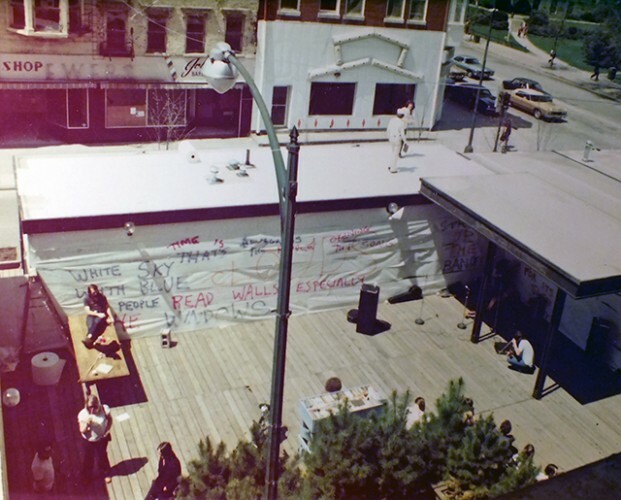 I see the destructive early 1970s Urban Renewal in Iowa City (while devastating to the city’s cultural identity and historic feel) as more of a precipitating event in the dissolution of the group of writers and artists in the core of the “actualist” movement. More important was the fact that Iowa City was a small pond, with a limited job market (especially for writers and artists), so, eventually, people had to look elsewhere. Add to that the fact that the Iowa Writers Workshop, which under George Starbuck’s direction, had attracted a diverse group of creative radicals in the late 1960s, had recoiled in horror at the cultural flowering (and become much more conservative). So there were fewer actualist-minded new students (or teachers) coming to Iowa City — at the same time that some of us were growing up and moving away, for all those reasons that young people everywhere do exactly that. My brother Steve Toth came to the University in 1968. He was accepted in the Writers Workshop and married fellow Actualist at the Westly House May 26, 1972. As with most movements, the time of its exact creation and most formative events depends greatly on whose eyes these events are seen through. I recall small mags. Steve and Sheila called their’s P.F. Flyer. They stayed in a trailer on Mc Bride leaving for the oceans of hope in LA in 1978. Last year Tom Walz and I put together a book inside the creative mind of Dave Morice (the informal but undoubtedly the finest archivist for the Actualist Movement) called “Dr. Alphabet Unmasked”. It tells the story of how Darrell Gray came up with the name while doing an odd job painting a white picket fence with Dave. I’m sure if you could ask the cast you’d get different timing and different stories but they would all be true. The real point is, there was a revolution that occurred in Iowa City when a small group of writers questioned written communication. From that came everything from twitter to car ads of today as writing lost its starch and became malleable and now more than acceptable to write as you speak and more. Still in the heartland, since the late 1970s I’ve seen no literary revolutions of note since, so if Iowa City is foolish enough to bull-dose the shrines of a movement, still then will never erase its impact from our present U.S. culture. It is especially poignant, as those too many of the original 15 have passed. Their voices now heard only from writings past. Iowa City might indeed be foolish enough, but they should think twice if they believe some stop & park, $1 store or bland storefront pimping whatever food or fad of the day will ever pay them back as much as preserving a moment in time when a handful of poets, converged on this Iowa town – each for their own reasons – freed the word and put it on rolls on newsprint and gave it back to the people who carried the message to everyone…you are your own poet. Say it anyway you want. Ask any teen, they know this…but they don’t know it came from the Iowa City Actualist Movement. I was a student in the Workshops 1968-1970, poetry and fiction, and had a teaching assistantship, and my wife was in the film & tv department, with an assistantship from the department’s national magazine. With these riches, we maintained a VW bug and a rented house. We were casual friends with Dave Morice who, among other projects, published poems on matchbook covers. We helped him a little bit. Anselm Hollo was a terrific teacher there, and so was Starbuck a terrific teacher. In the Workshops there were painfully few women. In 1988, I taught for one semester as a guest poet. I could remember where the old, enriching buildings had been and frequently visited those sites in the new malls and apartment complexes. Teaching with me in 1988 in poetry were Marvin Bell, Ann Lauterbach, and Ira Sadoff. I went to most of the readings around town. Was an Editor of APR from 1973-2006, with a flair for publishing radical work. Never heard the word actualism in any of these places, times, positions, or acquaintanceships. Anybody have any ideas?